Product Includes: Dress with attached apron and hat. Tell the story of a cute witch that your little girl can dress as. 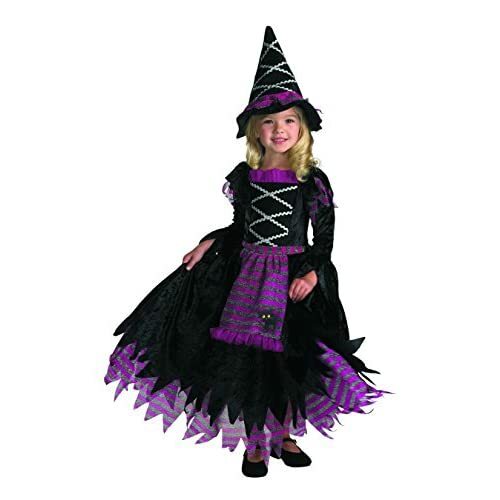 Our Fairytale Witch Child Costume is a great choice for youngsters who love playing the part of a witch! You receive a long, lovely dress made of a black, purple, and grey combination. The skirted portion is layered and features a tattered hem. The upper body has a lace-up design with long sleeves. An apron piece features the image of an adorable cat character. Top off the ensemble with a matching pointed hat. Pretending to mix potions and ride a broomstick is fun when wearing the Fairytale Witch costume! She is the witch that every girl dreams of. She is beautiful and elegant, she is the one and only Fairytale Witch. This costume is cute and fashionable, but still is classic Halloween. The full dress with cat graphic and matching hat is perfect for you little girl and she will just love being the Fairytale witch she always wanted to be. Includes: Full-skirted dress with attached apron and matching hat.